In my younger days, I would've been a prime candidate to buy either of those plates: I grew up in Madison, a die-hard Brewers and baseball fan who also cheered on the Badgers. But now? While I still follow those teams' results and I am a proud UW graduate, it should be obvious that my passion lies elsewhere. I took a look through the specialty plate listings on the Wisconsin Department of Motor Vehicles website. The list of 13 available plates includes several other sporting entities, including the Green Bay Packers, Golf Wisconsin and Ducks Unlimited – Trout Unlimited will be added in the near future – but nothing for the state's thousands of soccer players and fans. So how about a soccer license plate? The organizations whose logos are on those plates receive a $25 donation as part of the $40 annual purchase fee, which is in addition to the vehicle's standard annual registration fee. (The state keeps the other $15). My thought is that these proposed soccer plates should help support the growth of the game, so I bounced the idea off the Wisconsin Youth Soccer Association, the non-profit governing body for the vast majority of the state's youth teams. "I think it is a brilliant idea," WYSA president Peter Mariahazy wrote in an email, noting that the donations from the proposed plates could be earmarked for specific projects such as inner-city youth programs or TOPSoccer, which helps children with disabilities play soccer. At least five states – Florida, Georgia, Indiana, Mississippi and North Carolina – offer specialty plates that benefit youth and/or amateur soccer. Each state has its own guidelines, policies and fees, and each governing body uses the funds received for different purposes. Florida and Indiana both have their TOPSoccer programs as a primary recipient of donations. However, getting a specialty license plate added in Wisconsin isn't easy. To be added to the state's roster of options, a state legislator has to introduce the new plate to the legislature on behalf of an individual or organization. The request has to be approved by the state Senate and Assembly and be signed into law by the governor. Then the task turns to finances: The individual or organization – so WYSA, in my proposed scenario – has to pay between $43,000 and $45,000 to the state to cover the cost of the data processing necessary to have the plates issued. That fee can be paid up front or collected from plate donations. At $25 per plate, roughly 1,800 would need to be sold to cover the set-up fee. Of course, if each of those plates were renewed each year, it would result in $45,000 in annual donations to WYSA. If you're wondering how many people in Wisconsin have specialty plates, DMV data shows that there were 55,000 of them in 2012 – or about one-half percent of the 1.02 million plates issued in the state that year. Unsurprisingly, the most popular sports plates were the yellow ones with the Packers' iconic "G" logo, with nearly 16,000 issued in 2012. At that time, there also were approximately 12,000 plates supporting endangered species in Wisconsin, 8,000 plates with UW system school logos (all campuses combined) and another 8,000 with one of the two versions of Brewers logos available. So what do you think, Wisconsin soccer community? I know I would buy one, but are there at least 2,000 other people out there who would purchase a "Support Youth Soccer" license plate? WYSA registers approximately 54,000 players per year, according to Mariahazy, and the vast majority of those players' families have at least one car, if not two. How about the legislative part – are there soccer-supporting state legislators who would back the idea? Perhaps Rep. Mandy Wright (D-Wausau), a former middle school soccer coach, or Rep. David Murphy (R-Greenville), who once served as the vice president of Neenah's Paper Valley SC? And what do you think of this idea for a possible plate look, designed for us by Michele Ripp? Log in below and kick it around in the comments. 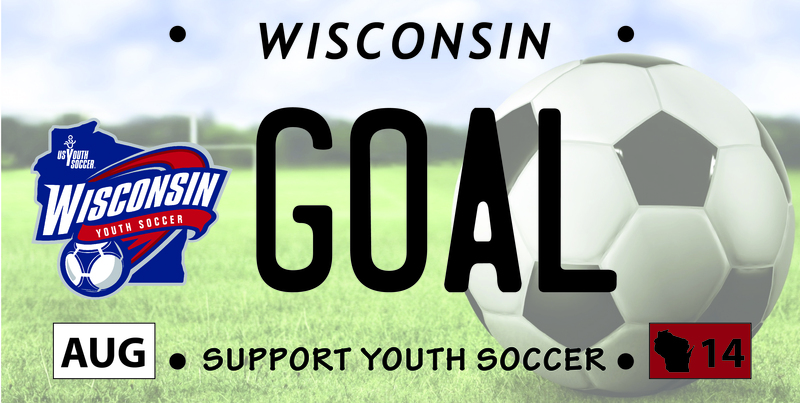 One possible look of a proposed "Support Youth Soccer" Wisconsin license plate. Design by Michele Ripp.